So, as you can see, you are all officially invited to the Faerie Festival! 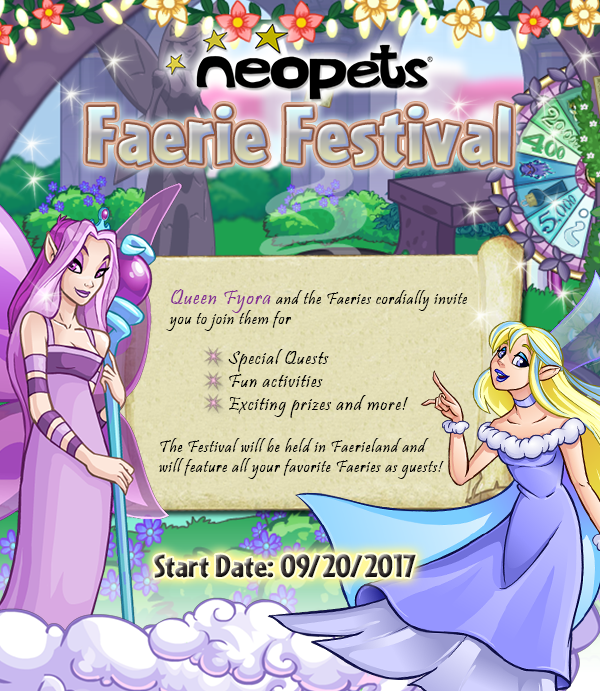 They're calling all Neopians throughout all the lands to join the Faeries, and of course Scrappy, to party it up in Faerieland!!! P.S. I finally got an invite!!! Hey, it's really getting obnoxious moving around the site in its current state. Sometimes I just want to check up on my Neofriends without having to spend several minutes of that process clicking cars and street signs. Is there a plan to remove that horrible feature in the near future? Thank you for your time. Yes, we know they are annoying. Yes, we are working on removing them. I can't give you an exact date that'll happen because I don't know the exact date but it's in the works!! Hellooo, when does the Premium Sale end? It's been on for a while! Well, my friend, Scrappy LOVES Halloween!! Sooooo, I might've gone a little crazy with the items but if you love October as much as I do then you will definitely not be disappointed!! I totally understand that some of the scripts don't particularly give you an advantage but unfortunately none are allowed to be used! It's one of those rules that can have far too many loopholes if we start using a case by case basis so we gotta stick to a hard no for this one! Sorry about that!!! I do hope none of your precious pet get unintentionally zapped!! Oh yummy! I needed this deeply! I am very glad you brought this up because I wanted to mention it! Ugh, don't tell me that they're sad...that makes Scrappy so sad!! I've just been absolutely SWAMPED buttttt this leads me to some exciting news! Scrappy is getting an apprentice! She will arrive on Monday and will start helping me out...she's new so if she makes a mistake please be kind! So yeah, with her help we will get the poetry contest up and running again (and don't worry, we will be releasing all the ones we've missed the past two weeks)! *stares at the sundae with disgust* Somebody. Take. That. Disgusting. Cherry. Off. My. Sundae.....*TNTer runs over and grabs it* Ah thanks buddy! Scrappy hates cherries!!! I will gladly accept the rest of the sundae though!!! Anyways, that pet slot...hm. Well, I would start brainstorming ideas for your next pet if I were you (both premium and non-premium)....but that's just me.